Not too long ago I was sketching up at the glasshouse terrace, the only part of the park that was still a building site. Walls were being built at the edge of the walkway that will curve along the front of the animal houses and aviary, and I was watching (and sketching) a skillful bit of bricklaying. After a while the bricklayer stopped to go off in search of something and as he passed me in the carpark he asked what I was doing, so I explained. (It seems he hadn’t been working on the site all that long and hadn’t seen me before). Bricklayer: Are you an artist? Me: Yes. I’ve been drawing this project since the beginning…. Bricklayer, thoughtfully: Only difference is, I draw with a trowel, and you draw with a pencil. I liked this, and wrote it down – though I didn’t really need to write it to remember it. It says a lot about what drawing is. Of course bricks (or Yorkshire stone) aren’t a sketchbook and a wall isn’t a drawing, but a trowel is a tool just as much as a pencil or a pen, and bricklaying and drawing both require eye/hand co-ordination and a lot of practice. When you do a lot of it and practise often, you get better at it and it more often goes well. 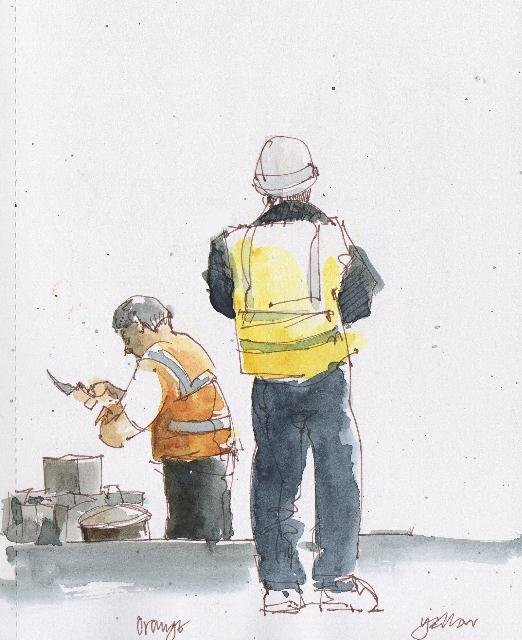 Not always – and I imagine bricklayers have good days and bad days just as a sketcher does, though the consequences of a bad bricklaying day could be more serious and long lasting than the times that I do wonky unsatisfactory drawings. I can just turn the page and start another sketch, and try not to mind when things don’t go right – though it’s a fact that I never get over the feeling of uneasiness whenever this happens. After days of not drawing, when I need a lot of warming up before anything will flow there’s always a small sinking feeling, a nagging little voice that says you’ve lost it, it’s never going to go right. It does come right, eventually, after a fair bit of exercise, but it always feels the same. I was talking about this with a sketcher-friend of mine recently, Louise Garrett, and she had what I think is the brilliant idea of carrying a rough book around as well as a current sketchbook. Something to scribble in and do quick drawings with lots and lots of looking, lots of warming up. Drawing is like dancing, or singing. It’s a physical-neuralogical-emotional thing, and you have to respect that and be patient. And just do the work. My ‘Drawing The Work’ project and the exhibition now on in Cliffe Castle are going to be the focus of the October session of Bradford Museums’ ‘Responses to Art’ programme – this coming Thursday, 5th October, 10.30 – 3.00. Very unfortunately I’m not going to be able to be there myself, but Joe Bean from Yorkshire Urban Sketchers is going to come along and talk about Urban Sketching – and hopefully bring lots of examples of his own work. Joe loves building sites just as much as I do and draws them brilliantly – he’s just done a wonderful series of sketches of the demolition of the historic South Stand at Headingley Stadium. I’m thrilled that people will be able to see his work at Cliffe Castle and have a chance to hear him explain what Urban Sketching is all about – like me Joe is a passionate urban sketcher! Anyone interested in going along on Thursday should ring Cliffe Castle to book a place, on 01535 618231. It should be an interesting day! The exhibition will be a lovely end to this project and it will give everyone a chance to see all your lovely sketches and the cards will be a bonus for the shop.I hope to visit the exhibition and enjoy the park with my friend who visited it about 50 years ago with her Gran. That visit will be a bit like time-travel! Do introduce yourselves to the museum staff and tell them about those childhood connections – they’ll be so interested, and they’re always happy to meet visitors and talk about the park and museum. Hope you enjoy the visit!